Low soil covering littoral plants camouflage the side of a pond, whereas the higher species provide with their stems and flowers volume and structure along the waterside. The plants are a feast for the eye. There is an enormous variation of colours, forms and sizes. 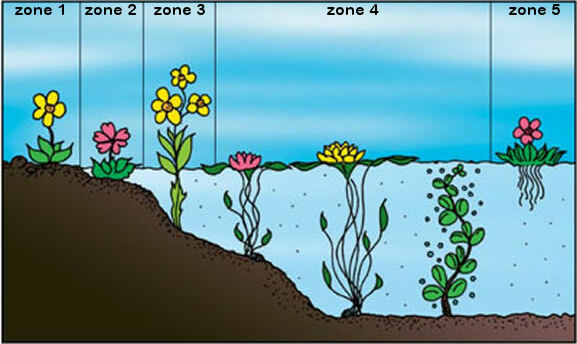 The biological function for pond environment with respect to littoral plants is determined chiefly by growth capacity. The more nutrients they can absorb from the pond water, the better they will grow. Consequently the chance of algal growth will be reduced. Littoral plants are standing as the word says on the pond side. They have to be in a swampy place, however, not with their feet in the water (e.g. yellow marsh-marigold). In newly installed ponds all kinds of littoral plants can be put in simultaneously. The nutritive substrate in which they are put should be as porous as possible. Water that is rich in nutrients and rich in oxygen can reach the roots better in this manner. Thus good growth is stimulated. Use nutrient soil or growth substrate for exuberant growth and blooming of roots and plant. Cover the soil with gravel to prevent rinsing out. Add, if necessary, additional iron and trace elements. 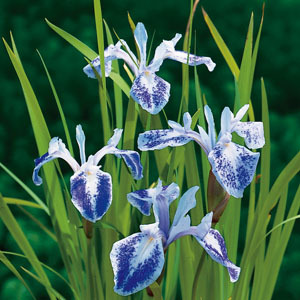 The best-known littoral plants are iris, the insectivorous trumpet pitcher plant (Sarracenia), corkscrew grass or curly soft rush (Juncus effusus Spiralis) and Arum (Zantedeschia). Vary with different colours, heights and forms of leaf, or maybe you just want a taut pond by using many of similar kinds. There are plenty of possibilities. Littoral plants grant a personal touch to natural pond sides! You can buy them in garden centres and pet and pond specialist shops.